I love cooking and baking, but often find I'm short on time and opt for quick and easy meal options especially during the working week. as I tend to avoid preparing complex meals which involve lots of chopping and grating. 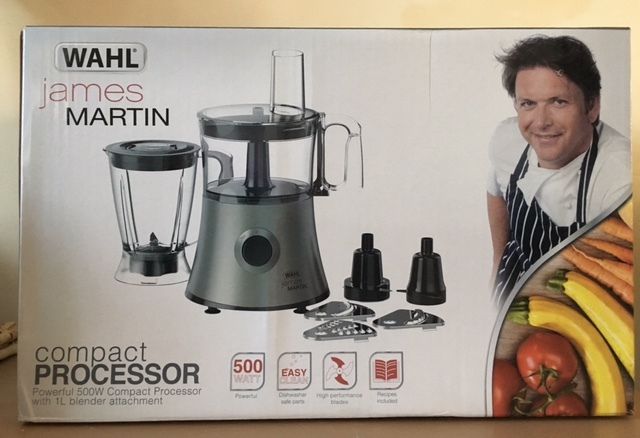 Many years ago I used to have a mini food processor to help me with my slicing and dicing needs, it didn't work so well as I'd often have to move the food around to ensure it all got sliced, so when it broke I didn't bother to replace it. So I was really excited to get my hands on this cool WAHL Jame Martin Compact Food Processor, the food processor not only looks really sleek but it's perfect for slicing and grating anything from vegetables, fruit and even meat, it also come with a 1 litre blender which is perfect for making smoothies and soups. the food processor comes with 7 attachments including, slicing and grating cutters, stainless steel blade, a whipping attachment and pastry dough blade. complete with a James Martin recipe booklet. I couldnt wait to put the food processor through its paces, so I decided to use it to slice some onions to make my much loved Eggy Pasta pasta.